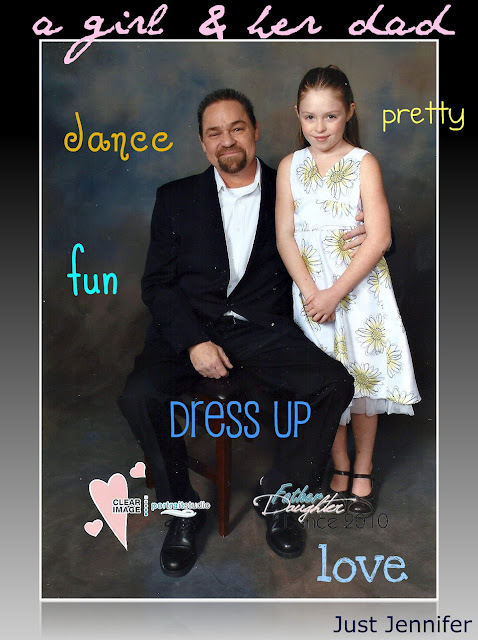 For several years now a Father-Daughter Valentine's Dance is held in our town. Two years ago Mark and Cami went. They both got all dressed up and posed for pictures. I think they were both a little nervous. Mark because he was taking his little girl to her first dance, and Cami because she was the center of attention. Camryn is her father's daughter, no doubt about it. He was the one who wanted to name her that, a girly-fied version of Cameron, which his mom had almost named him. The day she was born, it was very obvious who her daddy was. Upon seeing her for the first time, our priest said, "Well, she's definitely not the milk man's child!" But it's more than a family resemblance. Cami is so much like her dad, right down to her ADD (although he was never diagnosed). And now, she seems to have gotten an interest in cooking from Mark. I am proud of their father-daughter relationship because I know it is so important for a girl to have that, especially as she gets older. I know when I was a young girl I thought my dad was the best guy in the world. I also thought I could marry him when I grew up. So funny, the things we think when we're little. So I dedicate this month's Memories Captured, as well as today's Quotable Bits and this week's yeah write, to my husband and my daughter. so so sooo sweet. i can't wait for my husband and my girl to go to their first dance and pray their relationship remains as sweet as it is today. Oh I don't doubt the sweetness in your family! Sweet - did you just have yours over the weekend? I posted about ours today too - what a perfect way to celebrate VD! This was actually 2 years ago. I better go check your out! Awww Mark is beaming with pride. LOL (not the Milk man's child). He is definitely a proud dad. That is so adorable! There's just something so special about a dad and his little girl. Love this! I always think of the Steve Miller song where he sings, "we'll have a boy for you, we'll have a girl me, come on baby raise a family". Such a sweet moment! As a mama of two daddy's girls of my own, I'm so swooning over here! Thanks so much, Galit! Happy V-day to you too! that's such a sweet picture...Cami does look nervous too, it's so cute! I think I should have them go again next year, hopefully before she's too embarrassed. I took my 7 & 8 year old girls this past saturday and wrote about it - post called Vertigo from sunday. You called a post about taking your daughters to a dance "Vertigo"? I'm gonna have to check that out! Love that name too - Camryn. So pretty. You wouldn't believe some of the things our priest would say! I love it! Your post actually made me a little teary eyed! A father-daughter dance, how absolutely sweet. I wish we had those things here. 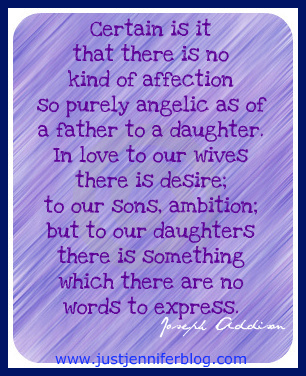 And it's so true, there's nothing like the relationship between a daughter and her father, and watching it is magical. Thanks for linking up, I loved this post! So beautiful. Seeing dads with their kids melts my heart. This is such a sweet post. I'm always glad to hear about fathers who are important in the lives of their daughters. Too many of them still prioritize sons first because they "have more in common", I think. The family my fiancee is a nanny for has a father like that. He is all about his two boys, but he "doesn't know what to do" with his youngest, the little girl. My fiancee wants us to have four boys. She thinks they are easier to raise. I, on the other hand, stand firm behind my willingness and desire to have four girls. I think daughters would be a lot of fun. Hopefully God gives us our compromise and blesses us with two of each once we're married. I think there are pros and cons to both genders. You'll get what you'll get and you'll love them all regardless! I'm loving all of these Daddy Daughter Dance photos that people are getting. It's so precious. Such a sweet night of memories. I'm really glad they did it. I think my daughter might be willing to do it one more time before she gets too old for it. I would not trade my daughter for a thousand sons! Sons are stinky! They've even done studies about father-daughter relationships. I also thought I might marry my dad when I grew up :) Too funny! What an adorable photo of your husband and daughter and also a great quote. Oh good, I'm not a weirdo! Sweet! I still remember a daddy-daughter dance I went to in Girl Scouts. They made me pose on this bike in my uniform and my dad was standing behind me. It really belongs on Awkward Family Photos or something. Not nearly as precious as this one. Oh man! Well, it's still a fond memory, right? that is about the sweetest picture i've ever seen. ... now i'm all nostalgic and wistful all over again about the fact that i have two sons and no daughter. somehow a mommy-son dance just doesn't have the same resonance. because, of course, boys don't dance. (unless they have sisters or, when they're grown, daughters, to educate them). BUT, boys LOVE their moms! And you can raise them to be great men and dads. What a beautiful picture! I love awesome daddy-daughter relationships. I hope my girls are always close to their daddy (they certainly know he'll let them get away with more than I will!). I think it depends on the day in our house re who will let the kids get away with stuff. I think we take turns.